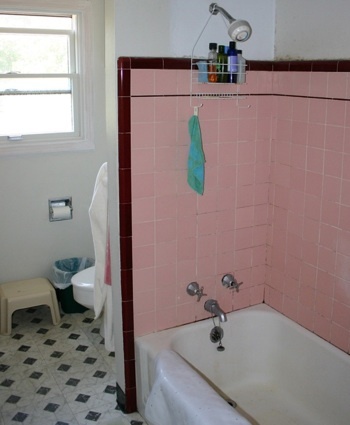 For years we lived with a bathroom that I called the Pink Horror. No ventilation (other than the window and door), a rotten (literally) paint job done by the house seller, and pink tiles. I hate the color pink, and Pepto-Bismo Pink just ain’t gonna be an exception. But finally, finally two years ago, we got everything stripped down to the studs, and in about a month we had a lovely functional bathroom. (Designing and planning always take the lion’s share of time!) Not in pink. 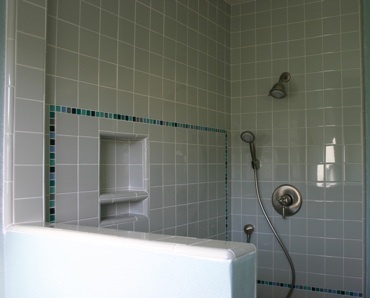 In greens and blues, since bathrooms are easy to associate with water, after all. 😀 It took me a couple years to get around to uploading the pictures, but there you go. After bathroom remodel (though shower doors were soon installed). This was written by sairuh. Posted on Thursday, March 6, 2008, at 12:32 pm. Filed under Dilettantism, Places. Tagged house, photography. Bookmark the permalink. Follow comments here with the RSS feed. Post a comment or leave a trackback. I love the mosaic tiles and the crispness of it all.